What Role Does Customer Service Play in Marketing? Business owners spend money to market and drive customers into their places of business, whether it be via a website or into a brick-and-mortar storefront. They've created the path and customers or clients walk in on that path, but what happens after they're there? What service do they encounter? Good marketing tells our customers why they should choose us. Customer service shows them why they should keep coming back. Marketing is the process of letting consumers know why they should choose your product or service over those of your competitors. If you're not doing that, you're not marketing – it's really that simple. The key is to find the right method and to define the right message to educate and influence your consumers. Companies make the mistake of thinking that marketing is just one thing, but it's actually much broader than that. It's everything the consumer encounters when he does business with you. This includes advertising, what he hears by word of mouth, and the customer service he receives. It includes the follow-up care that your business provides. All these efforts fall under the umbrella of marketing and creating a decision within the consumer as to whether to choose your company initially or for repeat business. Customer service is that personal encounter with your client or customer, whether it be via email, telephone or in person. How you conduct that personal experience determines whether you create a customer who will develop loyalty toward your place of business. 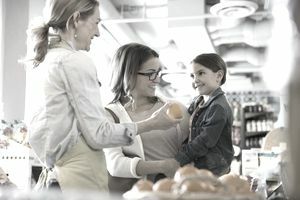 Good customer service makes a client or customer feel special and unique, and this comes down to efforts made and behavior exhibited by you and your staff. Are you impatient, holding a finger up for quiet so you can answer the phone or address someone else's question? This tells your customer that you don't have time for him or his concerns, so maybe he ought to take his business elsewhere. He's there at your business location because some aspect of your marketing campaign lured him in, so don't lose him now or your campaign was all for naught. Your marketing got your customers in the door, but did your service keep them there? Did it create loyalty and dedication to do business with you on an ongoing basis? Customer service is really the simplest component in this equation. It doesn't cost a lot of money. It stems from basic interpersonal skills. Be kind. Be attentive. Put your customer first and make sure they know they are first. Although a business needs to constantly attract and capture new customers, the focus and priority should be on pleasing and keeping your existing customer base. Companies that neglect to nurture and retain their customer base ultimately fail. Marketing brings a customer in, and customer service keeps them coming back.